Gustave Caillebotte’s Young Man at His Window (1876) is a favourite work by one of my favourite artists. Placing a male figure inside a new Parisian apartment, Caillebotte shows him looking out of an open window, over a chunky balustrade, and down onto the street below. Hands in his pockets, the young man’s pose is confident and alert—perhaps even a little predatory. We quickly surmise that he was probably only recently sitting in that plush armchair behind him; and that it may have been a glimpse of something or someone in the street that prompted him to stand to attention. For there, in the distance, Paris’s architecture converges around, and isolates, the distinctive triangular form of an unaccompanied female figure. How we understand an image obviously depends largely on the ideas we bring to it. Until recently, I would have related Caillebotte’s painting to what we know about the artist’s life, to Baron Haussmann’s rebuilding of Paris, to the idea of urban spectacle, and to questions of gender difference. Now I have another frame of reference for the painting. It comes from Sabine Rewald's Rooms with a View: The Open Window in the 19th Century, the catalogue of the Met’s recent exhibition of the same name. The show featured over sixty small-to-medium-size works with a common subject: they depict rooms, usually studies or drawing rooms, often inhabited, and featuring at least one window. These windows are generally (but not always) open, and offer views through to a surrounding landscape. The views range from generous to fragmentary: a few works provide no real view at all. Despite the E. M. Forster reference contained in the exhibition’s title, Rooms with a View is more Biedermeier than Bloomsbury, and contains works by both well-known and obscure Austrian, German, French, Russian and Scandinavian artists. (You can see a selection of works included in the exhibition and catalogue here.) 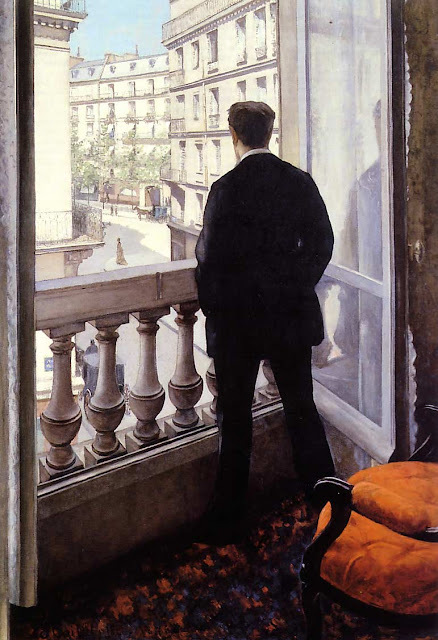 Made during the first two-thirds of the Nineteenth Century, they are obvious precursors to Caillebotte’s Young Man at His Window, which falls just outside the project’s (rather arbitrarily drawn) boundaries. In accordance with the firmly established format for an exhibition catalogue, Rewald’s 190-page book includes an introductory essay and seventy* catalogue entries. Each of these consists of a generous, full-page colour reproduction of the work and a detailed discussion of it. Comparative illustrations accompany both the essay and the catalogue entries, and the book concludes with a bibliography and an index. At the Met, the art was divided between four different galleries, which were governed by four themes: “Rooms with Figures”, “Artists’ Studios”, “Drawings”, and “Open Windows and Empty Rooms”. With the exception of the works on paper, which are marshaled together at the end, the catalogue entries are not subdivided in the same way. Nevertheless, these themes (as well as others) are abundantly apparent in the material. Rooms with a View turns out to be a pleasing and fascinating exercise in presenting variations on a basic theme. The manifest similarities between the various works are initially striking, but this feeling is quickly replaced by the pleasure provided by studying the telling differences between the works. These are explored intelligently and thoroughly by Sabine in her catalogue entries. She analyzes and describes the subtleties of these rooms, thereby prompting the viewer to look more and more closely. We learn about the rooms’ furnishings and objets d’arts, about the artists and people who inhabited them, about the subtleties of the artists’ depictions of light, and about how these images often interweave real and fictive elements. Period set designers and interior designers, as well as students of nineteenth-century art history, should certainly consider treating themselves to a copy. ...they focus attention on the view through the window into a distance beyond. Characteristically, they place the open window in the center, while in Dutch genres it is seen obliquely, in strong foreshortening, as a source of light but not an opening into space (285). The catalogue is dedicated to Eitner’s memory and, in its introductory essay, Sabine’s language sometimes strongly echoes his. 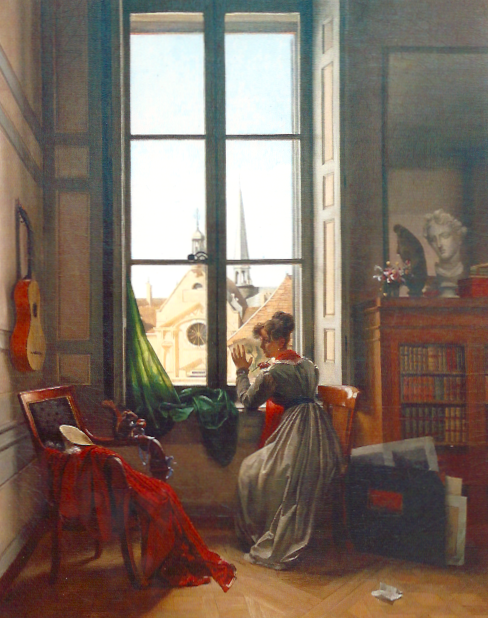 She includes several of the works Eitner discusses and apparently concurs with his assertion that these images of windows illustrate “perfectly the themes of frustrated longing, of lust for travel or escape which run through romantic literature.” This idea does fit nicely with some of the catalogue’s works—Caspar David Friedrich’s Woman at the Window (1822), for example; and it captures feelings we might ascribe to the man in Caillebotte’s The Man at His Window; but it also risks simplifying the rich complexities of the possible dialog between interior and exterior spaces found in these works. In particular, the formulation downplays the obvious attractions of the interior spaces. Rooms have their own allure, and windows domesticate the views they frame. To take just one example: a German or French artist who flaunts his studio’s view of Rome or Naples does not necessarily want to travel and escape. Rather, the point is that he has already arrived. The various rooms in Rooms with a View are sometimes monkish and plain, at other times modish and more luxurious. Many of the works speak eloquently of the increasing privatization of space, and of the desirability of having not just a room with a view, but a space devoted to study, work, relaxation, and contemplation. They are “rooms of one’s own.” Some fascinating French works show female artists at work and thus provide another obvious connection to Virginia Woolf’s famous text. Sabine points out that no similar German images survive from this period depicting female artists at work, but there are definite limits, it would seem, to French enlightenment. These works tend to characterize their female artists as students, rather than full blown artists: they work with a male instructor hovering over their shoulder, or they are using the light from a window to help them trace an image from one piece of paper to another. This might, of course, be read differently when the artist making the work is also female. Louise-Adéone Drolling’s work (Catalogue No. 31) shows a woman using a window to trace an image of a flower, but being momentarily distracted by a pet squirrel. Drolling makes a point about her own skills, as much as those of the woman she represents. No mere flower painter or mechanical tracer, she orchestrates a complicated interior scene, and one that includes elements of figure painting, portraiture, landscape, and still-life. And, in general, these works are hybrids and fall betwixt and between established genres: the subject may have become popular partly because it offered artists a way to demonstrate versatility and inventiveness. In the earlier works, windows are most often shown foreshortened and at oblique angles, as mere sources of light—without views. By contrast, in the nineteenth-century works, windows usually run parallel to the picture plane, with views seen through them. The qualifications (“most often”, “usually”) are necessary because it’s easy to come up with exceptions to this rule. But as a rectangle within a larger rectangle, these pictures inevitably begin to have a self-reflexive (or “meta”) feel about them. They show worlds contained within other worlds. Duranty re-imagines Alberti’s window. For him, the window is still a metaphor for image production, but the emphasis has shifted to the myriad ways one might frame an image, and how the artist should select a distinctive point of view from these various possibilities. Duranty, like Caillebotte, may also have been informed by his knowledge of the type of images explored in Rooms with a View, for his window is also different in the way it is firmly attached to a particular type of interior space, a “home” where we spend our time. His thinking may even have been shaped by Young Man at His Window, which he would have seen in the Second Impressionist Exhibition (1876). In his painting, Caillebotte selects just such an “unexpected” view, and also hints that we might imagine further possible views—and not only through the young man’s window. Peer into the cityscape beyond and you will see further windows. Eventually, you may begin to wonder whether at least some of these windows frame their own invisible figures. And what is to stop those unseen inhabitants looking back at the young man and (in a way) back at us? It is a possibility explicitly explored in one of Caillebotte’s later interiors. Alfred Hitchcock’s Rear Window (1954) suddenly feels close at hand. How, indeed, might one best frame the subject explored in Rooms with a View? The answer’s not at all obvious. 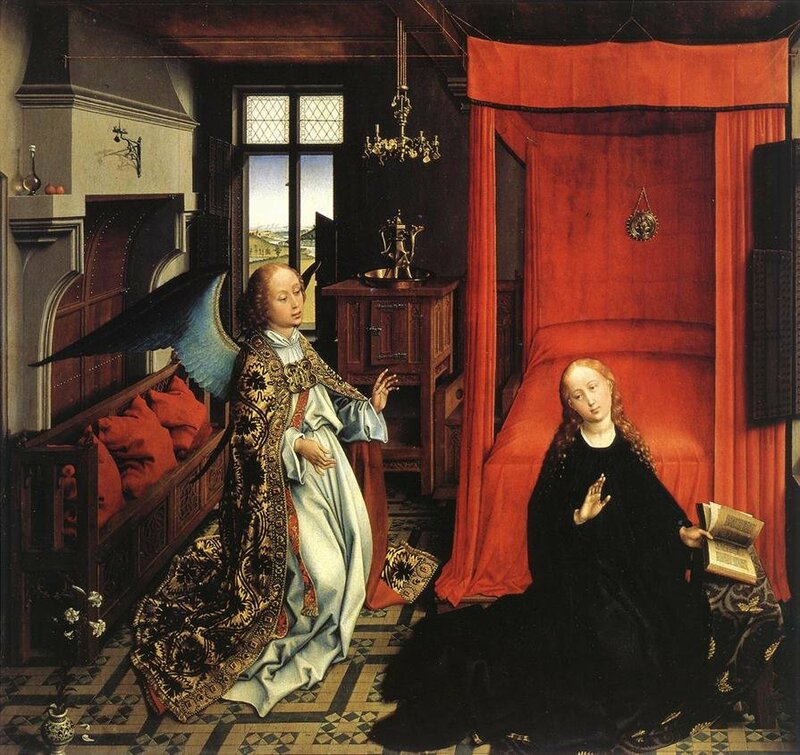 Why not start with, say, Rogier van der Weyden’s St. Luke Drawing the Virgin or Annunciation Triptych, or with a Vermeer? And where should the story end? 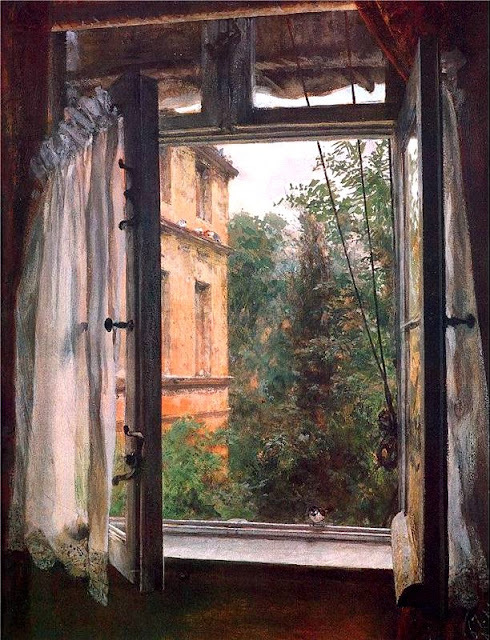 With Menzel’s View from a Window in Marienstrasse (1867), the most recent of the works in the catalogue; with the painted windows of Bonnard, Delauney, and Magritte, which are mentioned in Rewald’s essay; or with the three-dimensional and “real” windows of Duchamp and Christo, which are not? Restricting the account largely to the first half of the Nineteenth Century is certainly a practical solution and produces a tightly-focused exhibition. It also affirms the importance of Friedrich, whose sepia Views from the Artist’s Studio of 1805-6 evidently proved highly influential (Cat. Nos. 42 and 43). But in the catalogue, a longer introductory essay, or additional essays, might have more fully addressed the impressive chronological and conceptual sweep of the subject. As it is, the book offers a fascinatingly detailed exploration of its works, its rooms, and a tantalizingly partial view of the surrounding art historical landscape. *For reasons that are unclear, seven of the catalogued works were not included in the exhibition at the Met. Leon Battista Alberti (translated by Cecil Grayson), On Painting (Penguin Books, 1972). Edmond Duranty, The New Painting, reprinted in Harrison and Wood, Art in Theory, 1815-1900: An Anthology of Changing Ideas (Blackwell, 1998). Lorenz Eitner, “The Open Window and the Storm-Tossed Boat: An Essay in the Iconography of Romanticism.” The Art Bulletin 37 (December 1955), 281-90. Dr. Ben Harvey is a British art historian presently working in the US. With a great passion for the intersecting themes of art, literature and film - he explores these and other topics at Emanata, a weblog uniquely facilitated by Mississippi State University College of Art, Architecture and Design (CAAD), where he is an Associate Professor. Review copy courtesy of Inbooks Australia and The Metropolitan Museum of Art New York, distributed by Yale University Press. Thank you to Three Pipe Problem and Dr Harvey for this review. I was fortunate enough to see this exhibition and enjoyed Dr Harvey's summary of the catalogue. I agree such volumes are the perfect place to tease out the topic a bit more, but it seems Rewald was mandated to stick to the 19C. It is refreshing to see sites dedicated to reviewing such publications online, I will be gladly recommending both TPP and Emanata to my students. Bravo! Cheers for the kind comments J. I am pleased you enjoyed the review. I assume that you have seen Caillebotte's "View Through Balcony Grille" (1880). I think that painting is particularly interesting when thinking about thresholds and barriers. Monica: Of course, I was thinking of you while writing the review! Very nice Eitner quote. The complicated dialectic between interior and exterior spaces is certainly one of the things that makes these images fascinating. Yes, I love Caillebotte's view Through Balcony Grille, too. There are, in fact, a number of his works that feature windows, both from the inside looking out and vice versa. Of the latter, my favorite is The House (or Shop) Painters: http://goo.gl/OT4z0 And, even though they're not shown very prominently, I would also argue that commercial windows play an important role in "Paris. Rainy Day." In terms of thresholds and barriers, I really like the Menzel work H reproduces above. The bird (neither inside nor outside) is a brilliant touch. I didn't see the exhibition, but I loved the catalogue. Rewald noted that the Rom­an­t­ics found a potent symbol for the exper­ience of stand­ing on the threshold between an interior and the outside world. The juxta­pos­it­ion of the close familiarity of a room and the uncertain, often idealised vision of what lay beyond was immediately recog­nised as a metaphor for unfilled longing. Tahlib added that the luminous windows were a yearning for something distant and ineffable, a metaphor for spiritual longing. I was happy to agree with these views, even though I am far from Romantic myself. However I wonder if we need another explanation for images like Adolf Menzel's View from a Window in Marienstrasse. Not much longing going on there!